Join us for a conference experience unlike the rest — the first-ever Canadian conference dedicated to integrated fundraising, marketing and campaigning for nonprofits and charities. Hello Cool World's Jada-Gabrielle Pape (Saanich & Snuneymuxw Nations), Kat Dodds (of Irish/Scottish Settler descent) and our media team will be presenting at Xlerate Day on #DecolonizeYourDay, as well as documenting the conference to create a short film. 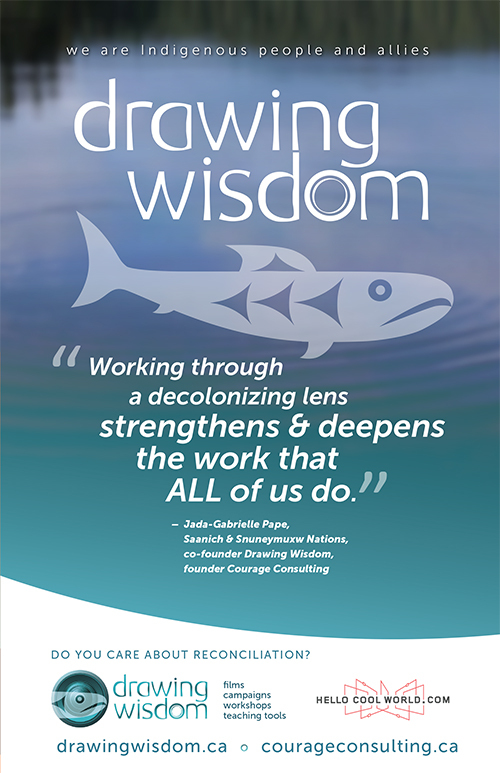 Co-Founders of DrawingWisdom.ca, they are working on creative decolonizing strategies address the Calls to Action from the Truth and Reconciliation Commission. They will be addressing how organizations can take action as allies in this moment when reconciliation is a National conversation. No stranger to integrated marketing, Kat oversaw the branding of The Corporation film and its groundbreaking campaign in four countries. Recognizing whose land you are on is the first step to realizing what ‘unceded’ means. in this climate of reconciliation, it’s easy for this to become a habit or an obligation. A decolonizing lens means asking yourself again and again: How is colonization still happening today? What can I do to resist?